We can’t find a lot of lamb here in the United States. When we do we jump on the chance to use it. As we had so much, last night we decided to make it two ways. 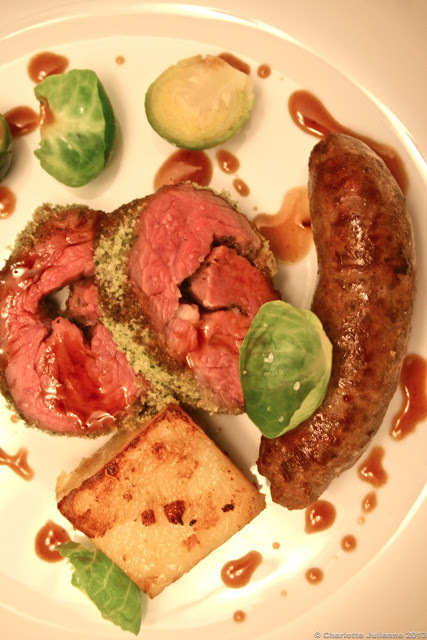 First, rolled leg of lamb cooked sous vide which we accompanied with our second dish, a lamb “Merguez style” sausage. First of all remove and save the outer fat from the leg. Select one or two really good cuts of the leg meat and the remainder can be cubed but remember to save the bone for a stock. Take one of your good pieces of meat, butterfly it then sprinkle with salt, pepper, olive oil and rosemary from the garden. Roll and tie and then place a garlic clove on top. Vacuum pack and set aside in the refrigerator. Cook in a water bath at 135 F for 3 hours. Remove from bag and set on a piece of kitchen towel to dry. Remove the rosemary and sear the lamb in a pan on the stove. Allow to rest. In a pestle and mortar place 1 teaspoon of cumin, 1 teaspoon of salt, 1/2 a teaspoon of coriander seeds, 1/2 teaspoon caraway seeds, a clove of garlic and a 1/4 teaspoon of chili flakes or powder. Add a squeeze of lemon juice and drizzle in olive oil until it takes on a paste consistency. 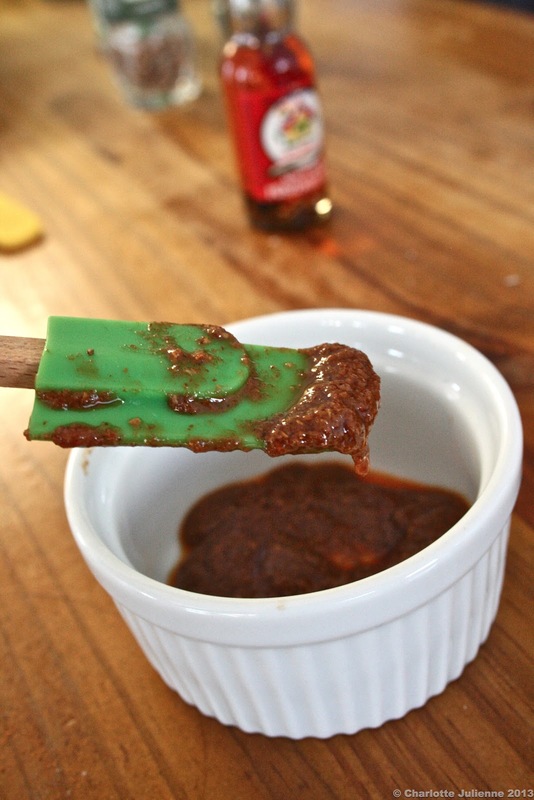 What you end up with is a Harissa style paste. 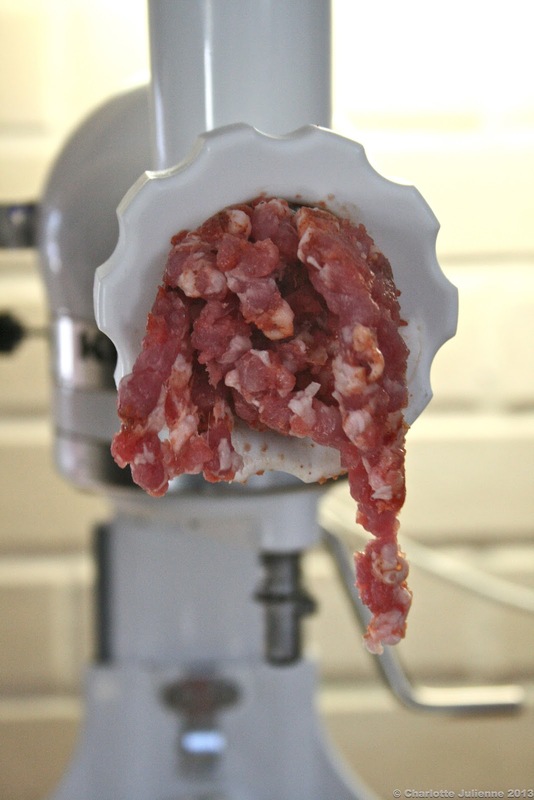 Cut into chunks 1000 grams (or 1KG) of the leg meat and 200 grams of the fat. Then in a bowl combine 2 T paprika, 2 garlic cloves, 2 teaspoons of the Harissa paste, a drizzle of olive oil, 2 teaspoons of salt and several good grinds of pepper. Allow to stand for one hour in the refrigerator. Grind the mix through a medium to large die. 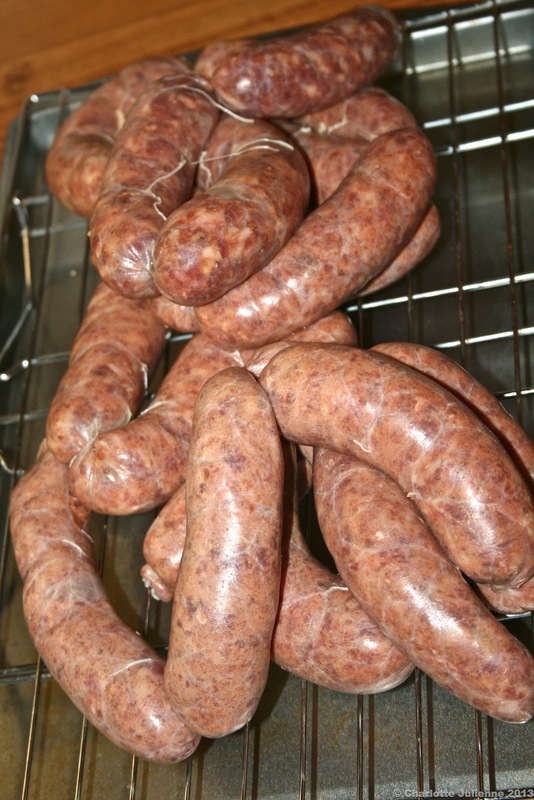 Stuff your casings and allow to dry on a cooling rack in the refrigerator overnight. Wanting to utilize the entire leg of lamb, we decided to make a lovely stock with the bone of the leg. We began by taking the leg and a sprig of rosemary and placing it in 400 oven to roast the bone until browned. Place the bone with a mire poix in a pressure cooker along with 2 pints of water cooking on high pressure for 40 minutes. Strain and cool then remove the fat from the top. Cut your potatoes and cook in some of this stock over a medium flame until fork tender. Remove and allow to cool. Finish the potatoes with a little olive oil and sear in a pan. 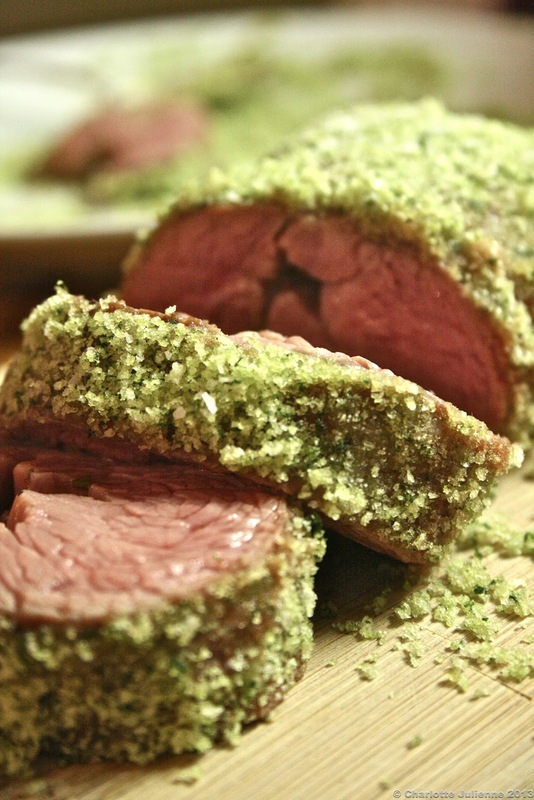 We took our rolled lamb and rolled it in a mix of Panko, parsley, salt and pepper mix. We cut into 1/2 inch medallions. You will see from the photo this lamb leg meat is still wonderfully pink but because it was cooked sous vide it was very tender. In a pan roast the sausage until cooked through then serve along side the lamb leg and the potatoes. We added a few brussle leaves for color and we made a simple lamb jus from the remaining stock. Lamb leg is generally braised over a long time. What we aimed to do here was to take this fairly cheap cut and attempt something other than braising. 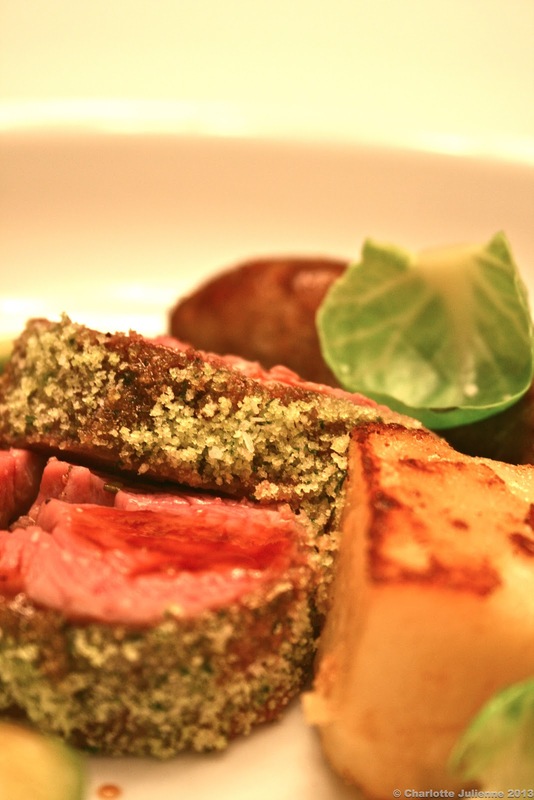 The result was that the roasted meat became something more like a rack of lamb in terms of tenderness and flavor. The sausage gave the dish a delicious North African note.